The Kindle Fire doesn't have access to the Android Market. The only marketplace you get is the Amazon's own store. You can download books, magazines, apps, games, music and videos from there. Of course the app diversity is not even close to the Android Market one and not all apps are available for the Fire. Still there are really lots of apps and games, so you shouldn't worry that much about that. And the number would only grow from here on. There is a Store shortcut on every major section of the Kindle Fire - Newsstand, Books, Music, Videos and Apps. The Kindle Fire comes with very few preloaded apps - QuickOffice reader (you must pay extra for the editor), Facebook, Pulse, IMDB, etc. You can also install Netflix, Hulu Plus, Pandora, and more, and you will get access to their services as well. The apps are available in the Amazon's Store. The Amazon Kindle Fire is a 7" Android tablet and one might think it's in the same league as some of Samsung's Galaxy Tabs, the HTC Flyer, the BlackBerry PlayBook, the Acer Iconia tabs, the Toshiba Thrive, you name it. The list goes on but most of these go nowhere near, we're afraid, the record-breaking sales of the Fire. Now, which was the one again with the poor specs? Tip: the one that costs $199. 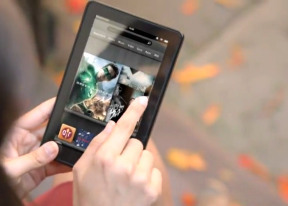 It should be clear by now that the Kindle Fire isn't the cheap Android tablet some people may've been waiting for. Oh well, it is cheap. Not so sure about Android and tablet. It's more like the Kindle for music and video that loyal Kindle and Amazon users may not have been waiting for but just couldn't say no to. The Kindle Fire keeps it simple. It's a multimedia player, which feeds mostly on paid content from Amazon's catalog. They've thrown in email and a web browser (not nearly as revolutionary as they said it would be, but not bad either). There's nothing else to distract users from its main purpose - buying content that's a click away. There must be people who bought the Kindle Fire - or about to - without ever planning to have an Amazon account. They can load their own content and find ways to play it, getting around the Fire's limited file support. It's not impossible to root the Kindle Fire either. And the effort may even seem worth it - $200 for a tablet is a bargain, no doubt about that. Amazon get nothing from such deals - they're reportedly losing money on every Kindle they ship anyway. The device is simply sold for less than it costs to build. So everything that's missing in the Kindle Fire is missing with a simple reason. To make it as unattractive as possible for anyone without an Amazon account linked to a credit card. In fact, the Kindle's direct competitor - the Nook Tablet - makes a lot more sense for this kind of "unlocked" use. It has a memory card slot for the whopping 32GB of extra storage. It costs only 50 bucks more and is reportedly a lot easier to root. It doesn't have the music and video content of Amazon but tries to make up for that with streaming apps like Netflix. Amazon is not a tablet maker - they're a digital content retailer. So, the Kindle Fire can be forgiven for not being the Android tablet some may've hoped for. What it does best is put a vast collection of music, videos and books a click away. Without an Amazon Account it is nearly as good as a BlackBerry without a BIS plan and half the QWERTY missing.